As the title suggest, the premise is by stripping down your shopping list and using merely five ingredients, arranged and put together in a creative manner to cook up a storm of enticing chow – and pronto, whether it's finished and on the table in a matter of minutes, or after a bit more involved preparation and the oven doing the heavy lifting. In essence: A lot of flavour disproportional to the time spent resulting in affordable, healthy meals that can be created any time. An ideal companion for busy people. One hundred and more hurry recipes are illustrated running the gamut from meat dishes to salads and vegetarian fare. The book is richly illustrated and comes with a detailed guide listing ingredients in a granular manner and backed up by the provision of nutritional information. Clear, concise and nicely put together. Each left hand page shows you the five ingredients down the left side and has the nutritional info underneath. The right hand page is a full colour photograph of the finished dish. There is an appendix with nutritional notes as to how to balance your plate with Veg and Fruit - carbs - Proteins - Dairy - fats and Oils. 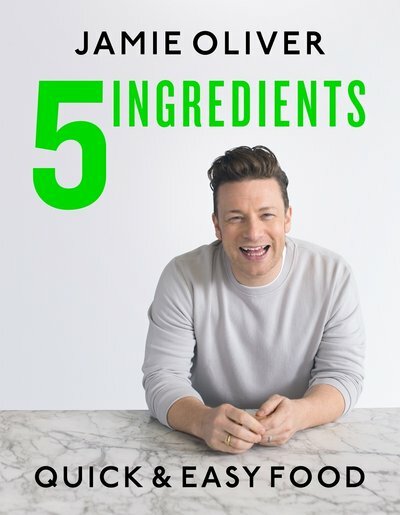 With fewer ingredients, Jamie is hoping to make people more aware of what is going into their food – something he is keen to do himself as he embarked on a nutrition course three years ago and is now studying for his masters.